We experienced record breaking attendance with 950 people! We had 69 Rising Leaders (college students/recent graduates with disabilities) participate in our inaugural Rising Leadership Academy. Eight job offers were extended by the Northrop Grumman Corporation to Rising Leaders at the conference. We expect more to come from other companies in the days to come. We had four disability-owned business enterprises (DOBEs) participate in our live, inaugural DOBE Pitch Tank hosted by Rodney Sampson. The US Business Leadership Network presented top awards on Sept. 21 during the annual conference Leadership Awards in Orlando, Fla. Recognition was given to four companies, two individuals and an affiliate network for their outstanding commitment to and work in the disability inclusion community. One of the pillars of the USBLN is supply chain. Part of the success of the Disability Supplier Diversity Program (DSDP) and the promotion of disability suppliers in corporate supply chains is the recognition of the USBLN as the leading national third-party certifier of disability-owned firms, including service-disabled veteran disability-owned business enterprises (SDV-DOBEs™). Paul Louden, autism advocate,was the event keynote speaker. Paul’s goal is to bridge the gap between those on the spectrum and those who are not. He was a witty, insightful and engaging presenter. Her educational accomplishments include a Master of Science degree in Human Resource Development from McDaniel College and a Bachelor of Arts in Communications from Notre Dame of Maryland, University. Millennial living with a disability. The Ideal Annual Session for Supplier Diversity Professionals, USBLN Certified DOBEs and SVDOBEs and Disability owned and Service disabled owned businesses! The Disability Employment Tracker gives your company the winning edge in the race for talent. Using the NationalOrganization on Disability’s proprietary approach, this free and confidential online assessment tool provides essential analysis of your approach to hiring and retaining talent with disabilities and veterans. New in 2017! Completion of the Tracker is required to be eligible for the DiversityInc Top 50 Companies for Diversity. After submission, you will receive a complimentaryScorecard benchmarking where you rank in relation to other all participating companies in each of the key employment aspects examined,including Climate and Culture, Talent Sourcing, People Practices,Workplace & Technology, Strategy & Metrics, and a Veterans component, plus insights into leading practices. Pre-register for the 2017 Tracker now! National Disability Employment Awareness Month (NDEAM) 2016 is here! 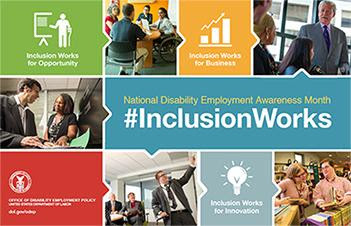 National Disability Employment Awareness Month (NDEAM) starts tomorrow, and this year's theme, #InclusionWorks, is intended to spur conversation on social media about the many benefits of inclusive workplaces, to both individuals and employers. To help contribute to the conversation, the ODEP-funded Campaign for Disability Employment (CDE) will be running a Twitter "quote-a-day" series featuring diverse voices from disability leaders, both past and present, as well as a "31 Days, 31 Ways #InclusionWorks" series on both Twitter and Facebook. Be sure to subscribe to both to get your daily dose of NDEAM spirit! USBLN Technology HUB to Connect Certified Disability-owned Businesses to Corporate Buyers! The USBLN has launched its new Disability Supplier Diversity Program (DSDP) technology tool, which will provide certified disability-owned and service-disabled veteran disability-owned businesses the opportunity to promote their cost-competitive businesses to corporate buyers and decision makers. The USBLN’s certification process is a critical tool to assist disability-owned business enterprises (DOBEs) and service-disabled veteran disability-owned business enterprises (SDV-DOBEs) access to supply chain contracting opportunities. The new USBLN Certification and Sourcing HUB will allow the organization to certify more DOBEs and SDV-DOBEs by improving the efficiency of the overall certification and administrative processes. This expanded pool of disability suppliers will bring increased innovation and competitiveness to the marketplace, promote job creation and provide people with disabilities greater self-employment and economic opportunities. Note: CAN was a DC Metro BLN Webinar presenter this year and we are excited to share this announcement with our network. The Caregiver Action Network (CAN) has developed a new program – Assisting Caregiving Employees (ACE) to help businesses and organizations support working family caregivers. CAN has been working to help shine the light on why it just makes good business sense to support those employees who are also caring for loved ones at home. This is why CAN, as the nation’s leading non-profit family caregiver organization, developed a turn-key, web-based program to provide working family caregivers with the tools and resources they need.The ACE Program helps employers ensure that their employees remain productive and healthy, and reduce employer costs. More information on ACE can be found at: WorkingFamilyCaregivers.org. We’re very excited about this program as we think that it is a low-cost (CAN is a non-profit) and efficient way to support working family caregivers. We are available to meet with you and/or other representatives of your organization to discuss how this program could help your employees. Caregiver Action Network is the nation's leading non-profit family caregiver organization working to improve the quality of life for the more than 90 million Americans who care for loved ones with chronic conditions, disabilities, disease, or the frailties of old age. Caregiver Action Network developed the ACE Program as part of its mission to serve the nation’s family caregivers. The Marketing Anthropology Project (MAP), a program of the National Business & Disability Council (NBDC) at The Viscardi Center, is conducting a self-selected sample survey on disability, and consumer attitudes and preferences. The survey seeks to better understand consumers whose buying decisions are mostly likely to be influenced by a business’ practices toward individuals with disabilities. Consumers with disabilities – as well as their non-disabled counterparts – are invited to complete the self-selective sampling survey. To complete the survey, go tohttps://www.surveymonkey.com/r/5F6RS8B. The survey’s findings will be used in a larger research context, supporting MAP’s efforts to better understand the attitudes, preferences and culture of consumers with disabilities. Please feel free to share the self-selective sampling survey with friends, colleagues and networks (disabled, or non-disabled). To learn more about NBDC’s Marketing Anthropology Project, please email me atbmacsata@viscardicenter.org. BenchmarkABILITY (www.benchmarkability.org) is an online benchmarking tool targeting HR professionals. This tool focuses on leading practices to promote disability inclusive workplaces. Six short surveys can be taken at the user's own pace on the following topics: Recruitment & Hiring, Career Development & Retention, Accessibility & Accommodation, Diversity & Inclusion, Compensation & Benefits, and Metrics & Analytics. Log on to BenchmarkABILITY to create an account currently at no cost, take the surveys and get your reports. View our promotional video for additional information. The Employer Assistance and Resource Network on Disability Inclusion (EARN) is pleased to announce the re-launch of its website, AskEARN.org. Featuring updated content, an enhanced look and feel, and a streamlined navigational structure, the new site is a centralized gateway to employer-focused tools, resources and training on disability inclusion. It also features a new Primer on Disability Inclusion for those who may need general guidance and background. Funded by the U.S. Department of Labor’s Office of Disability Employment Policy under a cooperative agreement with The Viscardi Center, EARN is a free resource that helps all employers—including small businesses, federal contractors, and state and federal government agencies—tap the bottom line benefits of disability diversity and an inclusive workplace culture. In addition to its website, EARN regularly hosts webinars and delivers customized trainings on a range of topics. For more information, visit AskEARN.org. Are you looking for ways to increase your customer experience for those with disabilities? As many of you may know, I retired from Marriott International after 35 years having held a wide variety of positions throughout the organization from positions in operations such as restaurant server, hostess and restaurant manager, to corporate positions at Marriott HQ most recently as Director, HR Compliance and I am well aware of how proper training is critical to customer satisfaction. Today, there is a free resource available to help you train your employees efficiently as well as insure the message is delivered accurately. I want to introduce you to one of our C5 clients, the Mid-Atlantic ADA Center for the ADA National Network (ADANN) which has created an "at your service" 20-minute customer service film. ADANN is composed of 10 regional ADA centers that provide great information, guidance and training on the Americans with Disabilities Act (ADA), including free resources, Webinars, and services. The 20-minute video and two-minute trailer are available in English, Spanish, with open captioned and audio described, and feature a variety of disability leaders who offer great tips on customer service to enhance your best practices. Take advantage of this resource today – your customers will recognize your efforts and become brand loyal! C5 is proud to serve as business consultants to the Mid-Atlantic ADACenter, along with EIN SOF Communications, Inc. C5 is a USBLN® Certified Disability-owned business enterprise. This webinar, presented by Jeanne Goldberg, Senior Attorney Advisor in the Office of Legal Counsel at the U.S. Equal Employment Opportunity Commission (EEOC) will review court decisions issued in 2015-16 raising new reasonable accommodation issues, highlighting examples of employer pitfalls and best practices for ADA compliance. These webinars will be archived for later listening. For today’s workers and job seekers, information and communication technologies are essential to getting a job and performing in the workplace. But numerous systemic barriers still prevent the development and adoption of technology that is accessible to many job applicants and employees with disabilities. As the next step in a series of stakeholder dialogues and listening sessions, the U.S. Department of Labor (DOL) and the Partnership on Employment & Accessible Technology (PEAT) are partnering to host an important online dialogue that you’re invited to join in honor of National Disability Employment Awareness Month (NDEAM): “Making It Happen: Increasing Awareness of Accessible Workplace Technology.” Through this virtual discussion, you are encouraged to vote on and expand upon ideas PEAT has already collected, and to share new ideas about the kinds of policies, programs, and structures that need to be in place to advance accessible workplace technology, along with ways that PEAT and the U.S. Department of Labor can support them. The “Making It Happen: Increasing Awareness of Accessible Workplace Technology” national online dialogue will take place from October 11 – October 18, 2016. Please join this important conversation and spread the word to other participants who may be interested. Register for the dialogue today! Thursday, November 3, 2016. Registration and networking: 10:30 a.m. Program:11:00 a.m.
R.S.V.P. by Oct.25 to LaPearl Smith.